I am pretty sure that you are wondering why such a title! Tell-me-more is a command line tool built using Python3 that provides information about the linux user and the system. The tool displays the users of the system, the current user who is logged in the system, and the memory information. To run the tool follow README . I have used regex-regular expression in Python3 for pattern searching. I have taken help of re module for pattern searching, argparse module for taking command line argument. Check the source code in github to stay updated. Finally batuli can save the channel’s logs. I can still remember the very first day when I and sanketdg joined the irc channel ##testbot to work for irc bot batuli and I asked sanketdg “Won’t batuli save the logs of the channel as batul does for dgplug?” , sanketdg replied to me “Make it save the logs if you can!”. 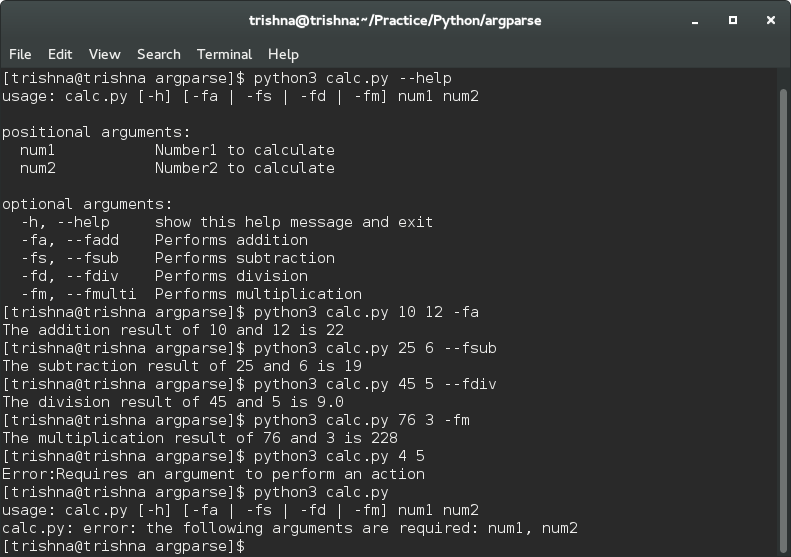 I have built Calci, a command line calculator for linux that performs basic operations like addition, subtraction, division and multiplication. I have used Python3 to build this command line tool. You will find that I had already made a blog post on Command line calculator earlier. Now this new post comes with some edits of the earlier one and another important thing is that I have made this open source . Since it is a command line tool you’ll need to provide arguments after python3 main.py . Type python3 main.py -h or python3 main.py –help to know this in details. you can also fork Calci on github and send pull requests to add extra features or edit the existing features. You are also invited to open issue if you find any. Kushal introduced us to command-line parsing module argparse in Python3 on Wednesday in dgplug. Well now I am having the real fun with Python. I have made a simple calculator using argparse that calculates addition, subtraction, division and multiplication. Run the code in Linux terminal as given below in the image.